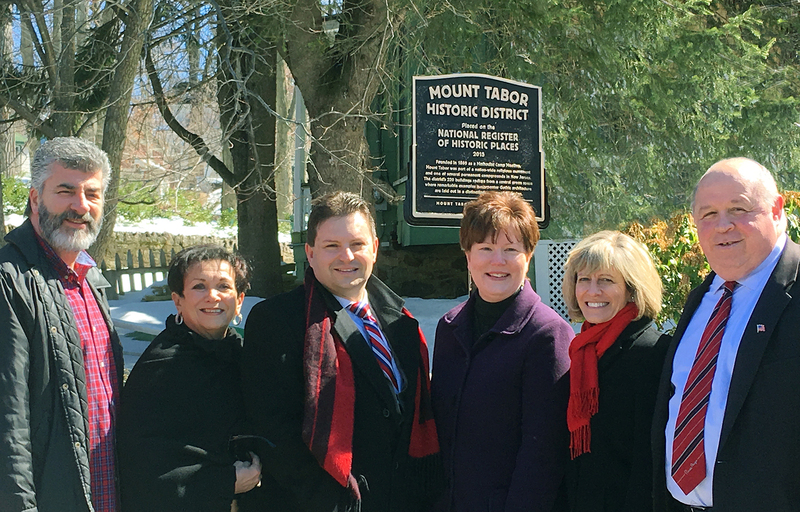 The Mount Tabor Historical Society is pleased to announce that a ceremony unveiling the National Register Marker commemorating the listing of the Mount Tabor Historic District on the National Register of Historic Places was held on Sunday, March 19, 2017. Several dignitaries were present to congratulate the Mount Tabor Historical Society on this great achievement including Morris County Freeholder Christine Myers, Parsippany Troy Hills Mayor James Barbario, Parsippany Council members Robert Peluso and Loretta Gragnani, Parsippany Town Historian Randy Tortorello and Camp Meeting Association President Richard Morgan. Also attending the unveiling ceremony were Mount Tabor Historical Society members and other community residents. Mount Tabor Historical Society President Michelle LaConto Munn had the honor to unveil the newly placed National Register Marker located in a garden near the post office parking on Simpson Avenue. A reception was held immediately following in the Bethel Pavilion. The listing marks a major milestone for the community and those involved in the nomination process, which started in January of 2011 with the assistance of grants from the Morris County Historic Preservation Trust to help fund the creation of a Mount Tabor Historic Preservation Master Plan and a National Register Nomination. This nomination required extensive research and documentation over several years utilizing a team of historic preservation specialists and historic architects overseen by HMR Architects. Educational outreach was provided through a series of meetings, programs and speakers presented to the public by the Mount Tabor Historical Society. 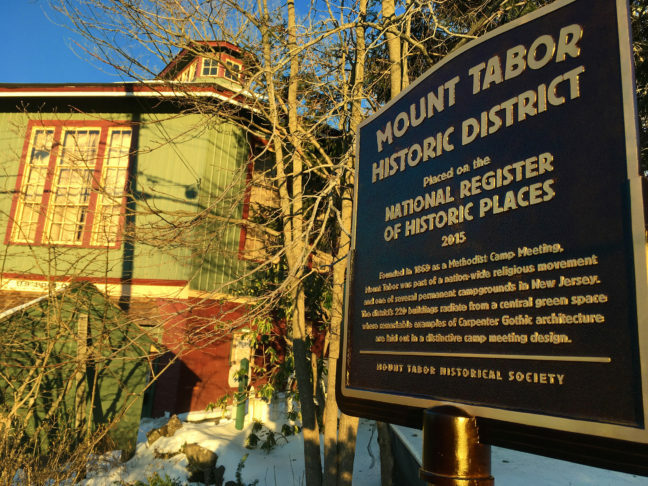 The Mount Tabor Historic District was officially listed on the New Jersey Register on January 8, 2015, and approved for listing on the National Register for Historic Places on March 3, 2015. Six years after the process began, it is gratifying that the historical significance of this neighborhood is thoroughly documented and officially recognized with an historic marker. The hope is that this recognition creates more awareness and sensitivity to the unique historical characteristics that contribute to making Mount Tabor such a special place to live.